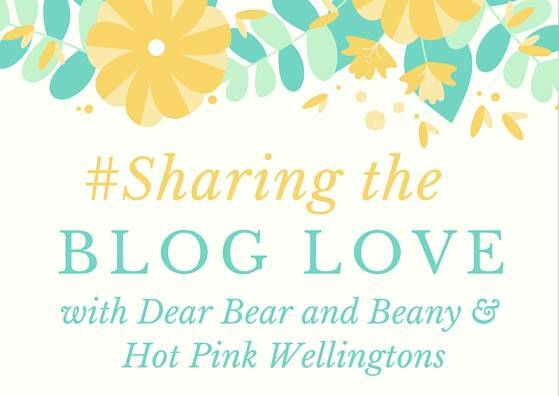 It is week three of my Sharing the Blog Love linky, which I co-host with the lovely Katy from Hot Pink Wellingtons. Who I got to meet this week and little Max, which was really nice. She is just as lovely as I thought she would be and little Max is just as cute as he is in his pictures. Thank you so much to everyone who linked up last week and all the lovely comments you have left us, we are really pleased to hear you are enjoying being part of our linky just as much as we love hosting it. There were lots of comments being left on posts with the #SharingtheBlogLove hashtag, which was fantastic to see and we appreciate everyone taking the time to leave lots of lovely comments for everyone. I loved reading all the posts that linked up and it’s great discovering new blogs to read. It was another difficult week choosing just 4 posts to showcase this week and I hope you enjoy reading the showcase posts as much as I did. And if that wasn’t enough exposure, both Katy and I will be linking our showcase posts up to #TheList, a great linky run by Aby and Amy. Thank you to these lovely ladies for allowing us to do this. Please make sure you add the badge to your posts, to be in with a chance to be chosen as a showcase post. Previous Post: « Review: Unique Planners…A Planner I Love! thank you so much for hosting, off to read some link ups now!